Crocodile Bay Lodge - Sailfish, Snook and Roosters! Crocodile Bay Lodge sits on the Osa Penisula, adjacent to one of Costa Rica's most beautiful beaches. Offshore and inshore fishing come together here in a phenomenal way. In the Golfo Dulce, anglers often raise a dozen sailfish a day. The 24' inboards make short runs to bluewater also inhabited by black, blue and striped marlin, tuna, dolphin and wahoo. 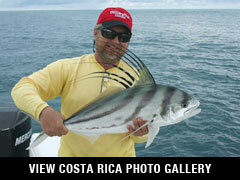 Inshore, volcanic structure provides light-tackle action for roosterfish. And in the mangrove estuaries, your guide will silently pole a back-country flats boat in search of explosive Pacific snook. This resort features 20 air-conditioned rooms with queen-size beds and private verandahs. Amenities include open bar, elegant restaurant and a wildlife observation deck overlooking tropical gardens. Non-anglers can snorkel, kayak and explore the rainforest National Geographic calls "the most biologically intense place on earth." The southern Pacific coast of Costa Rica has earned the reputation of having one of the largest populations of sailfish found anywhere in the world. Jump aboard new Rambo 24 or Strike 33 sport fishing boats for a 30-minute run to blue water to catch sailfish, blue, black and striped marlin, as well as wahoo, dolphin and tuna. If inshore fishing is more to your liking, just minutes from the lodge you can fish from flats boats in mangrove estuaries that feed the great Golfo Dulce. Flycast, spincast or troll through this tropical paradise, where multiple sportfish are ready to pounce on your offerings. The shoreline offers great fishing for roosterfish, snapper, Jack crevalle and other inshore species. $1000.00 per person. May be paid with personal check, certified check, money order or credit card. Final payments are typically due 60 days prior to departure. Lodge's open season is year round. Inshore fishing is along the shore and remains productive year-round.